Paul is an experienced corporate lawyer who was most recently the General Counsel and Company Secretary of Treasury Wine Estates Limited and, prior to that, the Chief Legal Officer and Company Secretary of Fosters Group Limited. Paul is currently the Group CEO of the TIC Group. Prior to joining Foster’s Group in 2005, Paul held a number of senior management roles with Southcorp Limited in Australia and the United States. 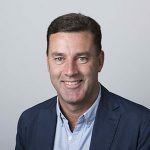 Previously, Paul was the Corporate Development Executive of MYOB Limited, was a corporate lawyer with Herbert Smith Freehills in Melbourne and Hanoi, and also worked in the London office of the international law firm, Mayer Brown, for three years. Paul is the Chairman and director of Summer Foundation and FareShare Inc, and a graduate of Leadership Victoria’s Williamson Community Leadership Program.